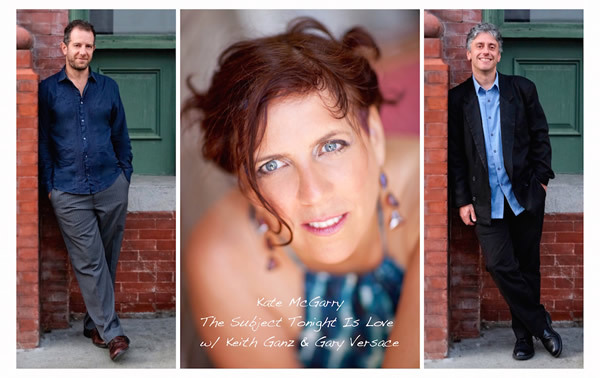 Kate McGarry: With 6 critically acclaimed CDs and a Grammy nomination for Best Jazz Vocal CD Kate McGarry has become recognized as a jazz artist who brings authenticity and vitality to every song regardless of genre. The Wall St. Journal calls her music, “Austere and elegant,” New York Times pronounced it, “astute and sensitive”. 2016 Downbeat Critics Poll named McGarry the #1 Rising Star Female Vocalist. She has been interviewed on All Things Considered, and has performed on Jazz Set w/DeeDee Bridgwater, Piano Jazz w/Marion McPartland, and a host of nationally syndicated radio shows. Keith Ganz: Keith Ganz is a guitarist, composer, arranger, and producer. He has performed with such jazz notables as Harry Connick Jr., Kurt Elling, Luciana Souza, Fred Hersch and Christian McBride. He has appeared on Oprah, Letterman, The View, Ellen, Australian Idol and toured the globe from Mongolia to Melbourne. Gary Versace: Jazz pianist, organist and accordionist Gary Versace has become one of the busiest and most versatile musicians on the scene, often featured in bands led by musicians such as John Scofield, John Abercrombie, Regina Carter, Maria Schneider, Madeleine Peyroux, Ingrid Jensen and many others. Versace has twice won the “Rising Star’ category on the Hammond organ in Downbeat’s Critic’s Poll. He appeared twice as a guest on Marian McPartland’s acclaimed NPR show ‘Piano Jazz,’ and McPartland has described him as ‘…endlessly inventive’.